Heavy-Duty Fume Extractor with Cleanable Filter Media - Sentry Air Systems, Inc. Does your business require heavy duty fume extraction, but the cost of replacing filter media deters you from getting the safety equipment that you need? Consider fume extraction with cleanable filter media. With smaller fume extraction units, the cost of replacing filter media may not cause financial strain, but the cost of filter replacement in heavy-duty models can add up and become cost prohibitive over time. Sentry Air Systems Model 500 Heavy-Duty Fume Extractor with Micro-Pleat Series 1 Filters (for particulate extraction) is capable of up to 1300 CFM of air volume and may be an appropriate respiratory safety engineering control for processes such as production welding (MIG, TIG, Stick, Plasma Cutting), grinding, powder weighing, multiple operator fume extraction, and some dust collection applications. With the use of pressurized air from an external source, the filter media (4 individual filters) can be easily cleaned and rejuvenated multiple times prior to replacement. As the operator sprays compressed air on to the filters with air from the outside of the unit, excess dust and waste falls to the internal dust pan, allowing for simple and clean debris removal. The included magnehelic gage is an excellent tool for determining filter saturation and a filter cleaning schedule. 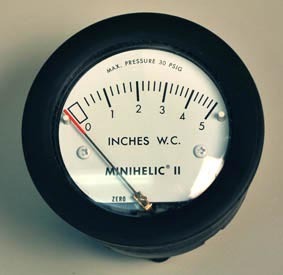 When the filters are saturated, the pressure will increase several inches (water pressure). This indicates that it is time to clean the filter media again. Results: After 2000 lbs. of flux wire, the unit and its filters were still performing with very little pressure drop and almost all of the original CFM after only 3 filters cleanings. For more information on heavy duty fume extraction with cleanable filter media, please call us at 1.800.799.4609, email us at sales@sentryair.com, or fill out this formto receive more information from one of our Applications Specialists.